The third largest of the British Virgin Islands, Christopher Columbus is rumoured to have named the island 'The Fat Virgin' because of its bulge in the middle, likening it to a plump woman. With sandy, white beaches and great snorkelling off the coral reefs, Virgin Gorda is a more laid-back and much quieter island than its Virgin island brothers of Tortola or St John. Key sights include The Baths, which are beautiful beach grottos, caves and pools along the beach formed by ancient volcanic boulders, and the Copper Mine ruin, which is located in the National Park and was first worked by the Carib Indians. There are two main ports in Virgin Gorda: in the Spanish Town area, ships dock at the Virgin Gorda Yacht Harbour, which features shops and other attractions; while the North Sound area tenders smaller ships into the main dock at the Bitter End Resort. Safari cabs and mini van taxis are easily hailed and the general rule of thumb is that the more passengers, the cheaper the fare. Andy's Car Rental and Speedy's Car Rental will send a driver to fetch passengers from the dock. A visit to The Baths is a must as well as to neighbouring Spring Bay Beach, which has a few less boulders and is not nearly as crowded. Nature lovers will enjoy exploring the Gorda Peak National Park or scuba diving off the shores in the crystalline waters of Virgin Gorda. The Bath and Turtle - small casual eatery in Spanish Town. 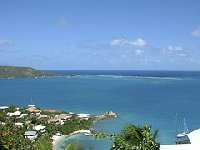 Saba Rock - affordable pub fare with fantastic views over the water. The Crab Hole - clean and authentic West Indian restaurant worth finding. Most of the shopping in Virgin Gorda is centred round hotel boutiques but those looking for a bargain and locally made crafts should take a trip to the Virgin Gorda Craft shop in Spanish Town. The Thee Artistic Gallery is also worth a look, as this eclectic boutique sells everything from maps to jewellery and other nautical themed trinkets. Still in the Spanish Town area, the Virgin Gorda Yacht Harbour Shops sell a wide range of touristy souvenirs and gifts, and a few clothing shops can be found here as well. In North Sound, the Bitter End Yacht Club, which is more of a resort, features plenty of gift shops but the shopping options are not nearly as diverse as in Spanish Town. Local crafts made from straw and shell. Hike in Gorda Peak National Park. Go yachting in the bay.